3 stars of brooding film-noir style thriller. Josie is written by Anthony Ragnone II (Endings Inc.) and directed by Eric England (Contracted, Cured). It tells us the story of Hank (Dylan McDermott – The Perks of Being a Wallflower, The Practice) a loner and widely regarded as the local loser. He lives alone at the rundown Pink Motel, with only his pet tortoises, Neville and Francine for company and by day he hangs around the local high school looking out for delinquents. This leads to frequent run-ins with rebel students Gator (Daeg Faerch – Hancock, Pushing Daisies) and Marcus (Jack Kilmer – The Nice Guys, Palo Alto). He also has an uneasy relationship with his neighbours at the motel, Gordie (Kurt Fuller – Anger Management, Midnight in Paris), who insists on referring to him as “Hanky Panky” and his wife Martha (Robin Bartlett – Shutter Island, City of Angels), who are suspicious of him and his mysterious past. 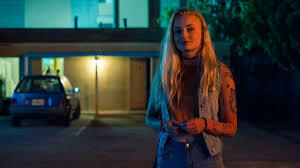 His already messy life is thrown further into disarray by the arrival of high school transfer student Josie (Sophie Turner – Game of Thrones, X-Men: Apocalypse), who moves into an adjacent flat alone with a vague tale of her parents joining her later. Josie is immediately taken with Hank and demands his attention, which he is happy to give even against his better judgement. She begins to try and help him improve his relationship with his neighbours who strongly disapprove of the friendship and he spends far too much time spying on her sunbathing by the pool. He becomes jealous when she starts seeing Marcus but can’t seem to stay away. It is clear from the start that there are shady pasts and ulterior motives at play here and it is quite good fun trying to work out what those are. The acting performances are good and although it is very slow paced, it builds nicely to a surprising twist. It’s an enjoyable watch for fans of the thriller genre and probably an even better watch for fans of Sophie Turner in a skimpy bikini. 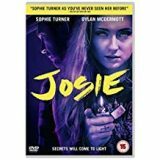 Josie is available to buy now on DVD.